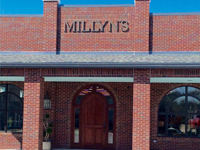 Welcome to Millyn’s, your source for unique gifts and home accessories in the Arkansas River Valley. At Millyn’s, we strive to give our customers unique products at competitive prices along with impeccable, gracious service. When you visit our store, you are a guest in our “home” and our aim is to make you feel welcome and well-served. Millyn’s is located at #124 South Front Street in Dardanelle, Arkansas, just minutes from downtown Russellville and Interstate 40. Millyn's has great Razorback items! We have Razorback paper goods, serving pieces, bags & totes, sunglasses, jewelry, door & wall pieces, tempered glass cutting boards, coasters, BBQ spatulas, ornaments, picture frames, Tervis & Bentley glasses, martini & wine glasses, throws, baby blankets, piggy banks, bath robes, and much more!